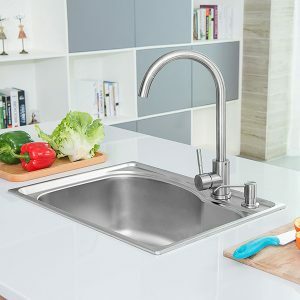 When you want to complete your kitchen with an aesthetically pleasing sink that provides perfection in use and maintenance, we have a highly-durable product for you. Quality Products, Excellent Service, Unbeatable Value! CreaVe offers superior-quality kitchen sinks in the market. As one of the leading suppliers of China kitchen sinks, we ensure that our products comprise of the sophisticated features. We have a comprehensive range of high-grade kitchen sinks, including both single bowl and double bowl kitchen sinks. Each of our fixtures is manufactured from superior stainless steel, and tested for durability, and scratch-free, noise-free use, because we want you to have a satisfying experience prepping for meals and other kitchen work. 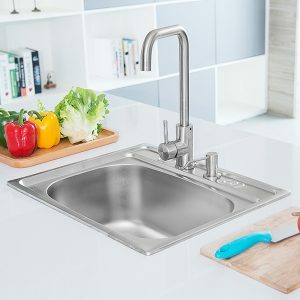 We also provide essential modern kitchen sink parts and accessories for you to enhance the usability and integrity of your kitchen sink. 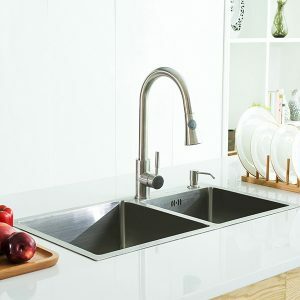 Buy kitchen sinks at wholesale rates from CreaVe. If you have any questions about any of our products, our friendly customer service team will be happy to guide you. 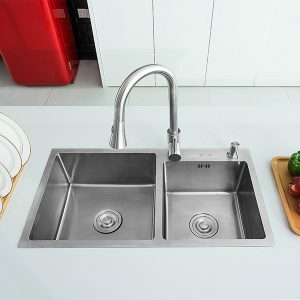 This stainless steel sink is built to the highest standards. It is made from heavy duty, quality steel and coated with a protective finishing that prevents rust and corrosion. Plus, the layer provides this large kitchen sink with a stunning, smooth finish that is oil proof, scratch resistant and bacteria free. The two bowls of the rectangle sink are deep for greater functionality and the bottom is padded so as to reduce kitchen noise. This sink is easy to maintain and can be cleaned quickly. A sink is one of the most important components of any kitchen, contributing to both functionality and appearance. This modern nano stainless steel kitchen caters to both extremely well! 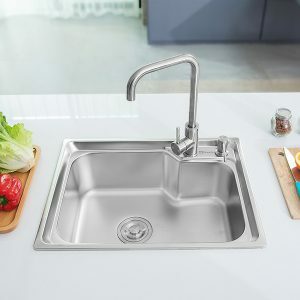 The rectangle sink is constructed using high quality steel, which is protected with an anti condensation coating. This layer, not only provides a smooth, sleek finishing touch, but also plays a role in warding off bacteria, preventing scratches and keeping the surface oil free. The sink features two bowls of different sizes. A sink is often the central focus of any kitchen, so it should be absolutely stunning. 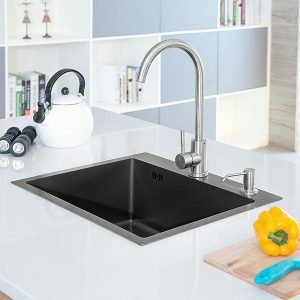 This nano technology black stainless steel sink is the perfect choice whether you are redesigning your kitchen or constructing a new one. 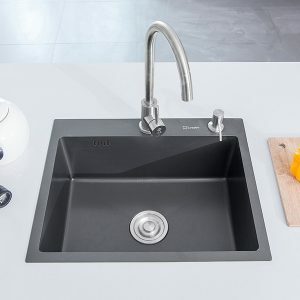 This rectangle sink is made from high quality steel and fixed with sound absorption pads to reduce kitchen noise. It comes with two installation options: undermount and topmount. The modern, sleek design and the deep rectangular bowl ensure greater functionality than standard options. 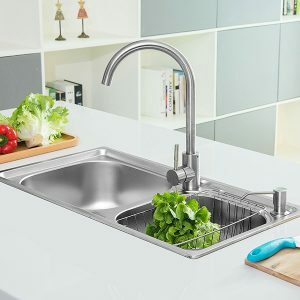 This stainless steel sink has a sleek look, designed to complement well in any kitchen. 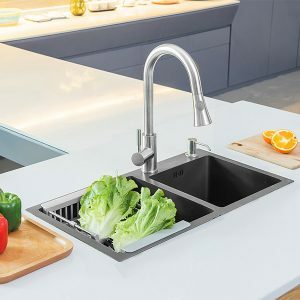 Featuring a beautiful neutral shade, this rectangle sink is made from steel of the highest quality which ensures greater durability than regular kitchen sinks. This sink is coated with an anti condensation layer for a smooth, easy to clean surface. The design supports both topmount and undermount installation. CreaVe’s sinks are manufactured using advanced processes at state-of-the-art facilities. They are designed after extensive research so quality and reliability are never questionable. 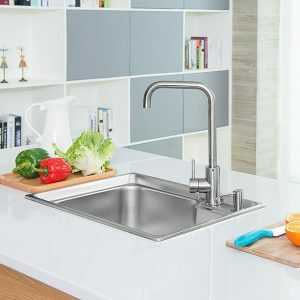 With its rectangular shape and sleek coating, this nano stainless steel sink is the perfect addition to any kitchen. Being highly functional, this single bowl, undermount sink makes chores easier. Plus, it supports topmount installation as well. 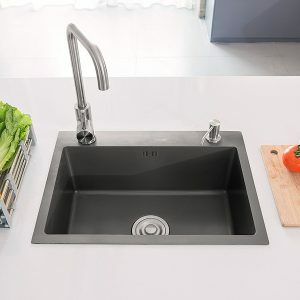 The rectangle sink features a length of 55 cm, width of 45 cm and depth of 20.5 cm. CreaVe’s nano sinks are protected with an anti condensation coating that ensures oil free, scratch resistant and bacteria free surface. This rectangular sink is the perfect combination of style, class and functionality. Featuring a single bowl, this sink has been designed so that it can be installed as topmount or undermount whatever you desire. The most startling feature of this single bowl is based on nano technology and coated with an environmental friendly layer, giving it a smooth finish. The sink is resistant to scratches, doesn’t get damaged due to oil and always remains bacteria free. Our Nano Stainless Steel is crafted from heavy duty food grade 304 stainless steel. 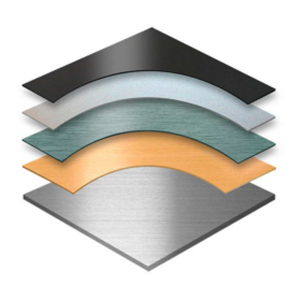 This means our stainless steel comprises a minimum of 18% chromium and 9% nickel for great anti-rust and anti-corrosion properties. Make a statement in your kitchen with CreaVe’s trendy double bowl, kitchen sink. Made from steel, a popular choice for kitchen sinks, this product offers same size for both bowls with design in style and elegance, integrating well in any space. 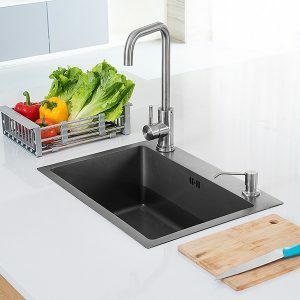 With its neat look, the modern sink is sure to suit a variety of kitchen styles. Prominent features include its quiet technology and durability. 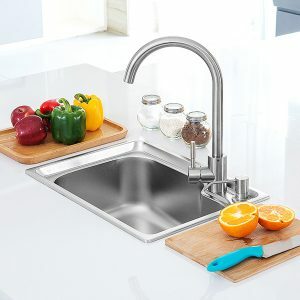 The CreaVe kitchen sink is resistant to stains and prevents rust. The sink has been treated so as to maintain water temperatures and not get damaged by hot pans. 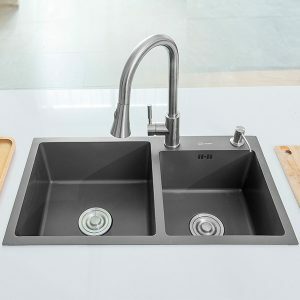 This double bowl kitchen sink is made from high quality steel which provides a non-porous surface that keeps bacteria away, offers a resistance to corrosion and scratches and prevents stains. The surface is also sealed with an external coating for added protection. With its two deep basins, the double bowl stainless steel sink can accommodate a number of bigger dishes with ease. The corners are rounded off for simple maintenance. The CreaVe sink comes with a sound absorption system that minimizes noise. This single bowl stainless steel sink features a luxurious satin finish which makes cleaning easier while protecting the product’s life. It comes with sound pads that reduce noise when the sink is being used. 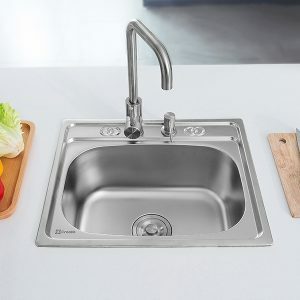 Made from stainless steel, this single bowl sink is a durable option that would last a good number of years in your kitchen. 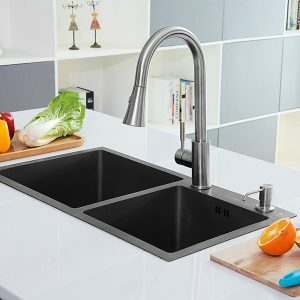 The kitchen sink can be installed as topmount. Its softly curved corners improve its appearance, adding to its elegance and making it easier to clean. 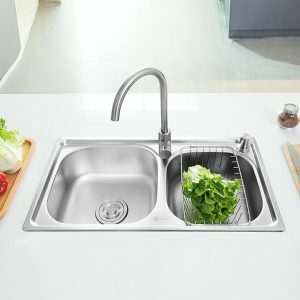 With its width of 35.8 cm, this sink makes kitchen work easier. 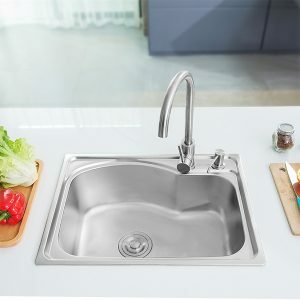 This single bowl stainless steel sink is an extremely durable product that you can use for a good number of years. 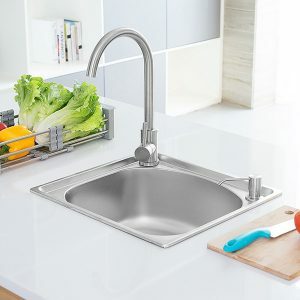 Steel provides durability to the sink and also plays a role in keeping bacteria away. The sink comes with a sound absorption system that lowers metal resonance and thus, the noise. This topmount kitchen sink is easy to clean and resists the formation of scratches. If the surface is affected a slight bit, the coating masks the defects. 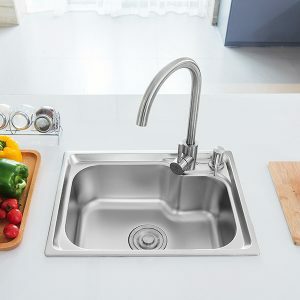 Looking around for a single bowl sink that you can use for as long as 10 years? Creave’s topmount installation, single bowl stainless steel sinks are what you need then. This farm kitchen sink has been coated with a protective layer so as to minimize scratches. 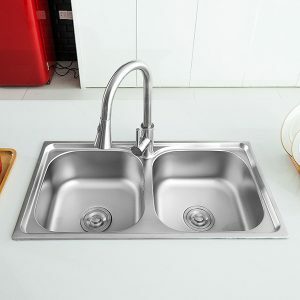 Plus, the rounded corners make it easy for you to clean the sink, while improving its appearance. 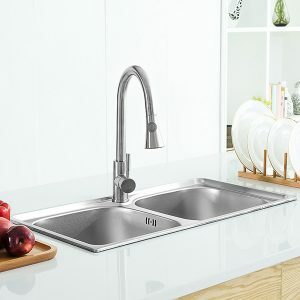 A modem and sleek curvy single bowl stainless steel sink that complements well with any existing décor. This sink features a wide bowl that softly curves around the corners so you get ample of space. Plus, the rounded edges make it really easy to clean the sink. 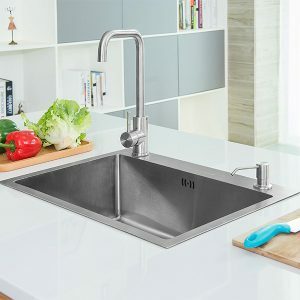 Designed for topmount installation, this single bowl sink features a sound absorption technology that reduces noise, ascertaining a quieter performance. 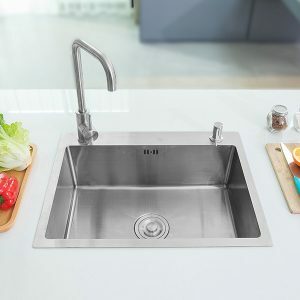 The top mount kitchen sink is made from porous stainless steel that wards off bacteria effectively and ensures longevity, without getting damaged due to scratches. A quality product that brings together aesthetics and functionality in a seamless way. This kitchen sink is made from stainless steel, featuring our signature finish, giving it a luxuriously sleek look. Even if it’s scratched, the finishing would absorb them within, ensuring the appearance remains the same as it is today, tomorrow and even after 15 years. 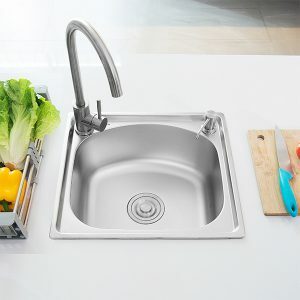 This single bowl stainless steel sink can be installed as topmount, serving as the central, focal point of your kitchen. Plus, it provides you with uninterrupted space for all you kitchen work.